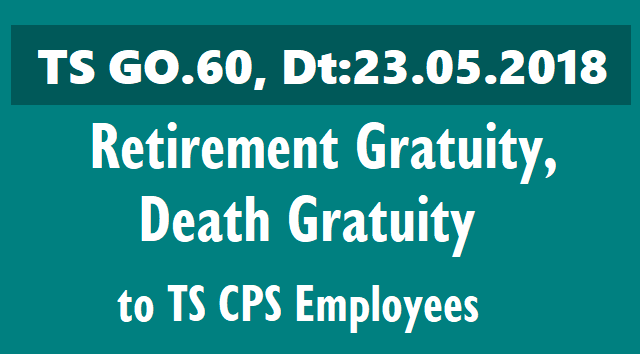 GO.60 - Retirement Gratuity and Death Gratuity to TS CPS Employees. TS CPS Employees are eligible for Retirement gratuity, Death gratuity benefit by GO.60. Government employees covered by Contributory Pension Scheme (NPS) shall be eligible for benefit of ‘Retirement gratuity and Death gratuity’ on the same terms and conditions, as are applicable to employees covered by T.S. Revised Pension Rules 1980. The State government on Wednesday issued a Government Order extending benefits of retirement gratuity and death gratuity to State government employees who are covered under the Contributory Pension Scheme (CPS). The GO said the Central government introduced CPS with effect from September 2004 for all State government employees recruited on or after September 1, 2004. Earlier, the employees covered under CPS were excluded from the applicability of TS Revised Pension Rules-1980 and employees covered under CPS were not eligible to avail gratuity benefits. Subsequently, the Central government allowed the benefits of retirement gratuity and death gratuity to government employees covered under CPS on the same terms and conditions as applicable to employees covered by Central Civil Service. Based on the Ministry of Personnel Public Grievance and Pension order, the State employees unions made several requests to the State government to implement the same. Considering the unions’ requests, the government extend similar benefits as allowed by the Central government and passed separate GO facilitating employees to enjoy the benefits of retirement gratuity and death gratuity. TS employee union president T Padmachary thanked the State government for extending benefits to State government employees. G.O.Ms.No. 60; Dated: 23-05-2018 :: GOVERNMENT OF TELANGANA - FINANCE (HRM.V) DEPARTMENT - PENSIONS - Contributory Pension Scheme - Extension of benefits of 'Retirement Gratuity and Death Gratuity' to the State Government employees covered by Contributory Pension Scheme (National Pension System) - Orders issued.